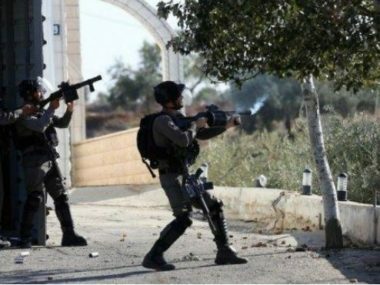 Israeli soldiers injured, Friday, several Palestinians after firing many gas bombs and concussion grenades at them, while many nonviolent activists were planting trees in Palestinian lands, in Beit Fajjar town, south of Bethlehem in the occupied West Bank. Media activist Hamad Taqatqa said the soldiers, and illegal colonialist settlers, attacked the Palestinians while planting tree in Abu Souda mountain area, west of the town, which is subject to constant violations and attempts of illegal annexation for colonialist constructions. Taqatqa added that the soldiers fired many gas bombs and concussion grenades at the nonviolent activists, causing many to suffer the effects of teargas inhalation. It is worth mentioning that the illegal Israeli colonists frequently attack the area, cut and uproot trees, although Israeli courts have officially admitted the lands are privately owned by the Palestinians.